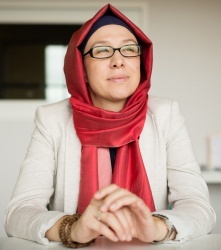 Nurefşan Çağlaroğlu, fairy tale and children’s literature writer. Born in 1968 in Bursa. Her childhood passed in Bursa. She completed his primary and secondary education in Bursa, and received her associate degree from the Faculty of Theology. She wrote in the magazines such as Bizim Aile, Elif, Turuncu, Can Kardeş. She is currently an administrator in a pre-school educational institution.